Does your company plan to become an exhibitor at an upcoming trade show? Consider bringing custom trade show booth displays. Building your custom trade show booth display may seem daunting, but we’ve got you covered. Regardless of what your needs are, the specialists at Canvas ETC can help. 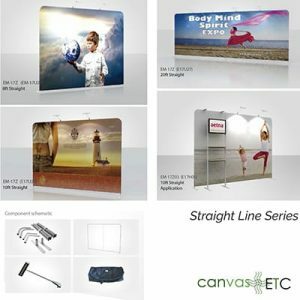 Canvas ETC understands that trade show booth displays add a critical dynamic to your overall presence. From a complex exhibits to a casual display, Canvas ETC has what you need. Let’s discuss the importance of trade show booth displays and how to transform the space you’re provided to create a display that attracts more visitors. Why are Trade Show Booth Displays So Important? Trade show booths are critical for anyone visiting industry events. From lighting to fixtures, every component needs to work together in order to communicate your brand. Although there can be lots of pieces that come together to form a cohesive space, today’s exhibit booths are designed for convenience. 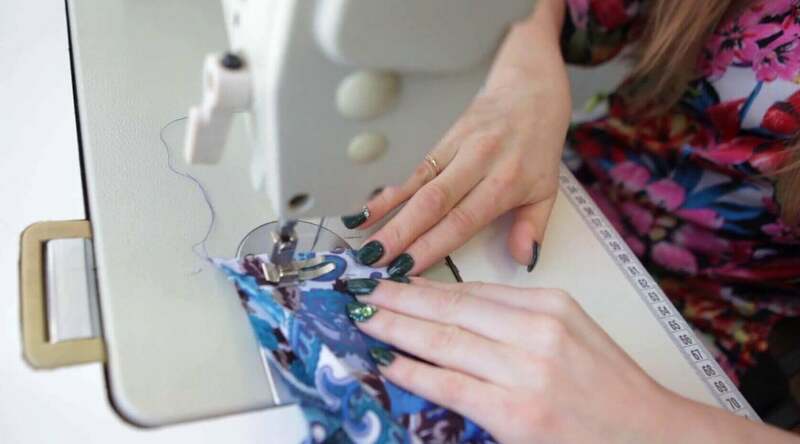 For ease of assembly, each Canvas ETC product is created to make your job easier. For instance, trade show counters are a focal point in your trade show exhibit. Use them to display products, marketing materials or to place staff to discuss your products and services with passersby. Trade show booths display your company’s logo and tell people from afar what you do. Well-designed trade show booths attract attendees based on look alone. That’s why it’s so important that you find the right designer to help you create the right booth. Canvas ETC has specialists on hand to help you get the right design for your booth. Branding Identity: Increasing your company’s visibility is key at any trade show. Each trade show booth displays usually comes equipped with ways to enhance your branding by adding your logo or company information with a fabric display. Trade show booths display what your company does and attracts visitors. Exhibit a Product: A trade show is the ideal place to roll out a new or upcoming product to prospective customers. Trade show displays are great exhibit your products, so your clientele can physically look at and learn the benefits of your products and services. Product displays on top of trade show counters will highlight a space within your trade show booth where visitors can see your products. Storage: Storage space is coveted and hard to find at any industry event. Finding the best place to keep your promotional items or marketing collateral is easy with well-designed trade show displays. Blocking Spaces: Space is typically limited at a convention center or event space. You’re usually given a just a small amount of space to assemble your space. If you’re looking to increase your floor space and make it more workable, consider a trade show counter. These main benefits of trade show booth displays are sure to make your next show a successful one. Trade shows generate sales leads for your business (if you’re doing it right). Trade shows are full of warm leads. That’s why they’re there in the first place! With the right marketing, your custom exhibit allows you to show off your company at its best. Honestly, having the right accessories helps too. Fabric display racks, trade show counters, flag stands, banners and more create engaging, hard-to-ignore exhibit booths. A trade show booth display from Canvas ETC will communicate your brand’s message and show off your company’s greatest assets. Making an attendee visiting your booth comfortable is important. Add a personal touch to your customer interactions by welcoming them with a reception counter where your staff greets them. The details matter when creating your custom trade show exhibit. 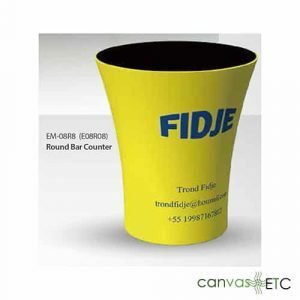 Canvas ETC is here for all your trade show needs. Counter displays, locking storage booths, banner stands, podiums and more all satisfy your exhibiting requirements. We’ll ensure your fabrics meet the standards and regulations of your venue with our fire-retardant fabrics, too. In addition to helping you make a great impression, there’s more to having a great custom display. Gaining high-quality leads means making money. Your bottom line and ROI on your trade show expenses rely on sales. Want to learn more on all we offer? Contact us today to learn more about how we can help you create custom trade show booth displays for your business.